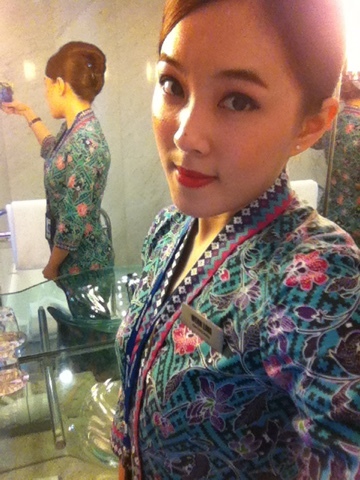 Proud to be a Malaysia Airlines Stewardess. - MisTan IzZy | Travel & Lifestyle. You might be wondering, how's our salary? How's our roster every month? Why? Because recently company has open up a lot of interesting night stopping station. For example, Male of Maldives! :D A paradise where everyone would dying for. Well, although you get to fly to ASEAN only, somehow it's still better than only Malaysia, am I right? Hehehee..
We do have a few night stop station like TPE/HKG/MNL/CGK/PER/KIX/BKK/MLE/KTM/HYD, and of course domestic night stop BKI/KCH/MYY/LBU/PEN/JHB/KBR/KUA/SIN. I believe you might not understand the code? Those are the airport code that used in aviation, learn it as early as you can :) because an airport doesn't name under a city name, for example, we don't call Taipei airport but instead Taoyuan international airport, and we don't call Seoul airport but instead, Incheon international airport. Most of the time, you will be working only with Malaysian. We do have Indian, Japan and Korean crew, as we need them to do announcement of their mother language and communicate with the local passengers, but that's all we have, not the other nationalities. At least, it makes your resume looks nice to some other airlines if you were to continue your career as a cabin crew.